Anyone who works in technology knows that it’s constantly evolving. And while it’s critical for anyone working in the tech world to stay updated on the latest and greatest, it’s even more crucial for IT and tech consultants to ensure they stay ahead of the curve so that they have a wealth of challenging projects to choose from over their long-term careers. These days, there are so many fabulous opportunities available to us in terms of ongoing education in the form of live and virtual seminars, classes, bootcamps and events. And while some of these can be costly, there are many that are either low cost or even free. So it’s clearly in your best interests to learn about these options and determine which ones are the most valuable. After all – not all of these courses are created equal. So what should you look for when seeking to educate yourself on a new technology? 1. Look for “hands-on” opportunities. Experiential learning is truly the best way to assimilate new skills so that you can walk away with what you need for immediate and real-world application. Rather than just listening to a professor speak, you can implement what you learned in the classroom. Employers want to see what you have done, not just hear about the theoretical knowledge that you gained from sitting in a class for a few weeks. If you’re in the application development space, there are some great bootcamps available for technologies such as Ruby on Rails. And often times, you will have the chance to network and build connections while you’re attending that might just land you a project placement. During these bootcamp sessions, you’re typically doing actual work for real companies, developing the code while taking the class. There are also conferences and meetup events that offer opportunities to dig in and get hands on with the material. You can roll up your sleeves and work with those who have implemented these skills themselves. 2. Online classes. You can’t beat the convenience of taking online courses. And if there is a hands-on project associated with it, all the better. Just be sure to do your research, look at the posted reviews, as well as the tales (or lack thereof) of success as a result of attending. Have attendees secured projects after completing the class? Negative reviews should obviously give you pause. In some cases, tech professionals shell out lots of money but don’t have any luck securing a role that lets them take advantage of their newly acquired skills. 3. Conferences. One of the positives about attending conferences is that many companies will pay for employees to attend. And conferences are great places to hear about new technology announcements and upcoming product launches. Most often, though, these are specific to the technologies that your company is using in-house. Still, you may be able to acquire new skills around these products that will help you advance to a higher level so it’s certainly worth the investment of time and money. 4. Certifications. 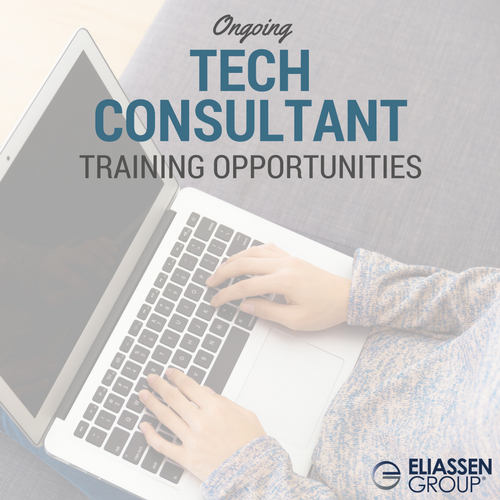 Many tech consultants spend time and money obtaining certifications. And these don’t typically involve on the job experience. So, while these certifications are great to have, you really need the experience to back them up. With Certified Scrum Master (CSM) in the agile space, for example, you can build up to the Certified Scrum Trainer (CST) role but you need the experience first and then you can obtain your CST. Keep in mind that many employers will pay for employees to further their technical skills so it’s certainly in your best interests to find out what these benefits look like. Some may offer courses on-site while others reimburse for the fees associated with classes. Just be sure you understand what is covered and what is not before signing on. And then there are often free events like Boston Code Camp where you can hear from some of the best developers and cutting edge technology companies on topics like Amazon AWS and Razor. In the technology community, you can literally find a Meetup for everything: DevOps, Java, Ruby, PHP, etc. If you’re interested in a specific skillset, there’s a Meetup out there for you! Our advice? If you’re looking to expand your skills and your career, you should definitely attend these events. This involvement will get you networked within your own tech community and will enable you to get some training, information and keep up with what’s hot in technology right now. Plus, you never know who’s going to be there. You could end up talking to your next employer! And on that subject, employers, there is often a wealth of talent at these events so it can be a great way to find candidates. You will often meet candidates that you can’t find on LinkedIn or in your database. If you attend regularly and build relationships with the organizers of these events, they are often willing to help spread the word about open positions and projects. For candidates, it’s a great way to build connections, establish influence and take your career to the next level. Companies like to see that you’re interacting and connecting with others; it shows that you’re personable and would potentially fit in well with their company culture. So now that you know the options, what will you sign up for? If you haven’t attended anything or taken any classes lately, commit to registering for one event or class during the next 3 months. Interested in learning more about local tech events? We can help! Shoot us a note at: solutions@eliassen.com and we’d be happy to point you in the right direction.